At the recent Stag Laying Up Dinner those attending managed to raise €1,000 for the Men’s Cancer Alliance. 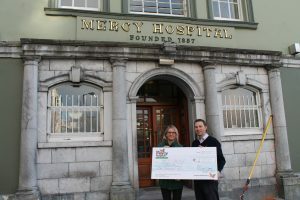 Gavin Deane, Club General Manager was delighted to present a cheque to Deirdre Finn who is the Campaigns & Community Manager at the Mercy University Hospital Foundation. Men’s Cancer Alliance (MCA) is the umbrella alliance, formed by the Mercy Hospital Foundation, Mater Foundation and Cancer Care West charities. The aim of the Men’s Cancer Alliance is to create awareness about men’s cancer and the treatments and supports available and to raise funds to create and maintain a number of men’s cancer support initiatives. The Mercy Hospital Foundation is the Southern branch of the alliance and supports men’s cancer projects in the Mercy Hospital. • Our Testicular Cancer Outreach which operates in secondary schools in Munster, with trained speakers educating young men aged 15-18 about Testicular Cancer. • Support the Rapid Access Prostate & Testicular Cancer Clinics which offer a fast and effective diagnostic and treatment facility for men with cancer. • Support the availability of a session Psycho Oncology service which can offer support to men dealing with feelings of anxiety, depression, anger and fear as a result of their cancer diagnosis. Thank you to all that donated to this very worthy cause.